ReadySuite 6.0.4 is released and now available to download. We recommend all customers using previous versions update to this release to benefit from new scripts, performance improvements, and increased stability. We’ve added 5 new workflow scripts and made several improvements to working with DAT files. We’ve added the option to ‘Save As’ to a new DAT file instead of overwriting only the existing file, the ability to change modes between DAT files and RSP (ReadySuite Project) files when saving, and ReadySuite will now save the records with an active filter and applied sorting to the saved DAT file. Use this script to extract bates numbers from text files linked to documents. 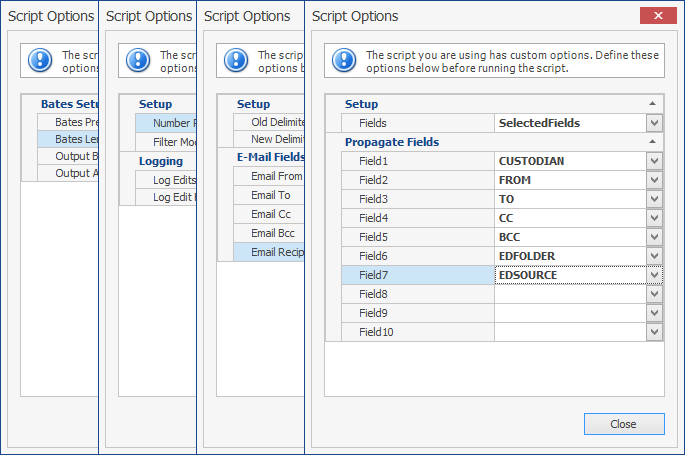 Script can output a new field for BEGDOC and a separate ALLBATES semicolon delimited field. When combined with the PDF script for Extract PDF Text, you can extract the bates numbers from searchable PDF files. This script will either keep or remove pages from documents identified by number ranges. For example, if document DEF00010 Is an 8-page document, and having a field populated with the value “3,5-8”, this script will remove the page numbers 3,5,6,7,8 inside (or outside) the given page range. When you receive e-mail metadata fields that are delimited with a comma instead of a semicolon, this script will smartly change the comma delimiter to a semicolon. This functionality existed with ‘Batch Update’ if the ‘Propagate to Family’ option was turned on. However, updating more than 1 field at a time was tedious to perform. Using the new Propagate Fields script, you can select either ‘All Fields’ or up to 10 fields at a time to apply parent metadata to attachment/child metadata. Receiving data with control characters (formatting and non-printable characters) can wreak havoc on correctly reading and parsing a metadata file or cause issues with loading data into destination platforms. We’ve added this script to detect and clean control characters from loaded fields. To see a full list of changes in ReadySuite v6.0.4, release notes can be found here.